The Skyjacker JK25BPH is a 2.5 inch lift kit complete with Hydro 7000 Shocks designed for both 2 door and 4 door JKs. The kit is complete, and it’s a good value for the money, and you’ll be able to run 33s on your JK with this setup. You’ll get about 3.5 inches of lift if you have a 2 door, and 2.5 inches if you have the heavier 4 door Wrangler. The only complaint we hear about this kit is about the shocks – most people say the ride a bit harder then factory. 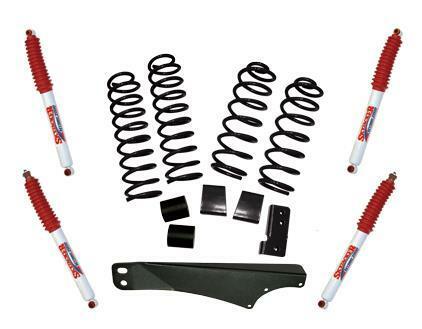 The shocks are bright red, and look great on most Jeeps, but keep that in mind when you order the kit.